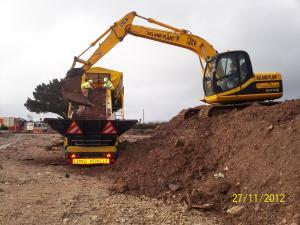 VertaseFLI was appointed by Taylor Wimpey to undertake remedial works at a Former Film Studio site, St. Agnes. The works were required to prepare the 10 hectare site for residential development. The site was heavily infested with Japanese Knotweed, which was present within dense vegetation, adjacent to buildings, within protected Cornish hedges, under overhead electricity cables and crossing the site boundary. VertaseFLI prepared and agreed with the Local Authority a Japanese Knotweed Management Plan outlining the remedial solution and control measures to be adopted on site in order to manage the Japanese Knotweed. VertaseFLI completed site surveys in order to identify the extent of Japanese Knotweed on site. Prior to remediation works, VertaseFLI managed enabling works comprising Demolition & Vegetation Clearance on site to ensure that any Japanese Knotweed present within these areas was properly managed. 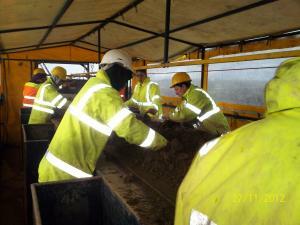 Excavation and treatment of Japanese Knotweed impacted soils was completed on site via a two stage screening process. The first stage comprised selective excavation and segregation (removal of large rhizomes and crowns) by hand. These soils then progressed to second stage screening processing via a mechanical screener and picking station to removal residual Japanese Knotweed. Following treatment these soils were placed in an area of public open space, where they will be monitored for two years. Approximately 6,000m3 of infested soils were treated following this methodology, resulting in considerable cost savings in comparison to traditional off-site disposal options. A herbicide spraying regime was also instigated to control the off-site Japanese Knotweed and prevent re-infestation. As part of the site works, VertaseFLI also completed re-profiling of non-infested soils on site to create a development platform and completed civil engineering works comprising the installation of a new culvert onsite.